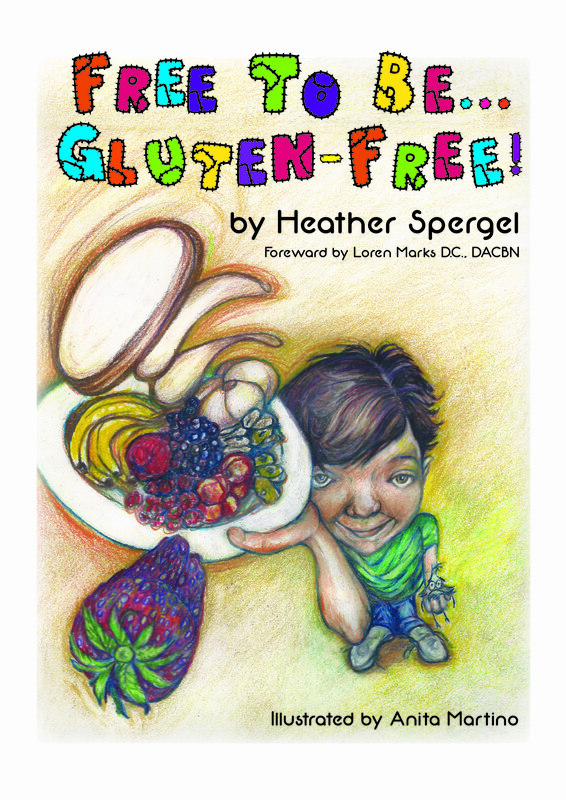 When I started work on “Free To Be… Gluten-Free!” I had all my memories fresh from my son’s (and my) experiences with food sensitivities/allergies. Various moms told me gluten could be the cause of my son’s sleep issues, mood swings, and exhaustion. I never understood what “gluten” meant, let alone thinking that this was the “Monster” in our house. This monster lurked everywhere. Tempting us with fudge brownies and cocoa muffins, tugging at us at birthday parties and family gatherings, challenging us to dare investigate the ill effects of gluten. I allowed denial to cloud my vision- that seemed far easier than changing our entire lifestyle- or so I thought. Gluten and corn, gluten and corn…. time for changes. My son was in preschool at the time and removing these foods created huge changes in our house. See my new book coming out and you will agree- he was full of GLEE and happy to be Gluten-Free! Go forward a few years and my daughter started preschool. Now she received non gluten-free foods with the other kids and juice on Fridays. Slowly her temperament took a turn for the worse. A sharp turn. I felt I was looking at my son with all her tantrums and meltdowns. There is a difference between developmental frustrations, normal emotional expressions, and reactions to food. I looked to my husband- a Chiropractor certified for Pediatrics and learning about using the IAT technique. To save time, save our questions, and bite the bullet, off to NY we went to Dr. Loren Marks again. Drum roll please. Yes, Gabi is also gluten and corn intolerant. Now I wonder about those hives 2 weeks ago that covered her trunk and legs! Like my son, we caught this before major damage occurred to her villi internally. Is this Celiac or just intolerance? In my mind, we caught it early and either way- a gluten-free and corn-free diet is required to heal the gut and therefore, heal this emotional instability. Living in a gluten-free house, this is easy! Is it easy for her? Maybe this is easier on her than some kids because she already eats all gluten-free at home. However, transitioning her off that yummy challah at school… I better go back my own challah ASAP! My recipe rocks by the way, and if I can fit it, you can try it from the “Free To Be… Gluten-Free!” book! Emotionally, I will reassure her about all the foods she can eat, just like Nathan! So… she joins the club- officially.. the gluten-free, corn-free, Spergel Club. So now I need a part 2… siblings joining in and needing the same diet. It’s a gluten-free club! Have you experienced anything similar? Do you wonder at time if you have an intolerance to a food? Maybe yours is mild and the symptoms not troublesome so you or your family continues to eat the food? Or perhaps your family has epi pens and knows full well the dangers of severe allergies… Either way, food… such a powerful item in our lives!!! Happy eating and best wishes for a healthy family!